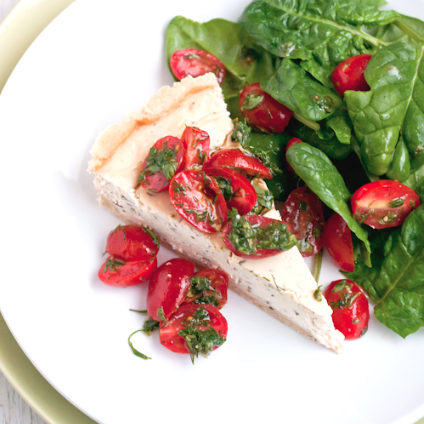 This recipe was developed in partnership with Red Star Yeast. Thank you for helping support our sponsors so we can bring you great content. My husband’s family is rich in cultures from around the world. We have relatives from Europe, South America, and the Pacific Islands, plus many who have traveled to all of the corners of the globe, including myself. It’s incredibly wonderful to see the way all of those cultures come together in the food we make when we gather as a family. My husband’s Aunt Robin and her family make loads of traditional Tongan, Samoan, and Hawaiian foods, which is pretty much the best thing ever. I still remember the day I was over at the house for one of Robin’s legendary parties and there was a pan of pani popo in the center of the table. I had never heard of such a thing, but soon realized what the fuss was all about. 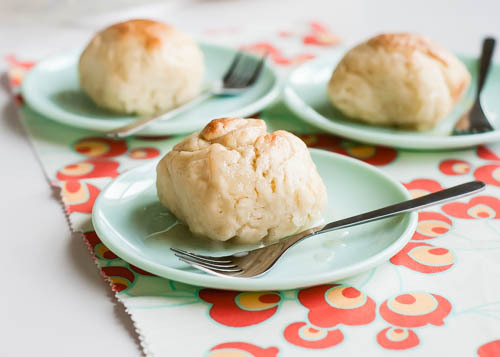 Pani popo is basically rolls cooked in a sweet coconut milk syrup. And I know what you’re thinking – what could possibly be wrong with that? And the answer is NOTHING. Nothing is wrong with that. It’s the most right thing in the world. Ever since then, I have been hooked. 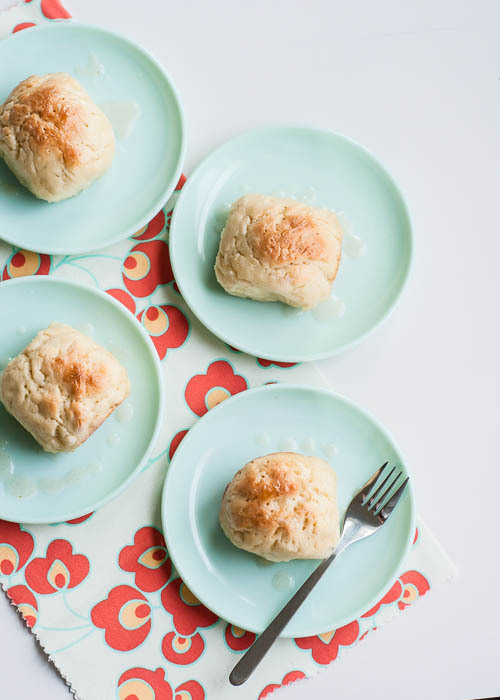 I was astonished how easy it is to make pani popo. Coconut is one of my very favorite things in the world, and I’ve been missing pani popo something fierce. So I decided to finally come up with a gluten-free pani popo recipe to take to Aunt Robin’s for Easter. Easter is not complete without coconut! I went to work planning out a recipe that would remain true to the non-GF pani popo recipe I’ve made before. I went for a little different dough than I’ve used in my other gluten-free yeast bread and rolls recipes. This one is made with a higher percentage of rice flours and more eggs to make them lighter and fluffier. They also soak up a lot of the sweet coconut syrup, which is a plus. These border on dessert, but we have also eaten them for breakfast. They are purely addictive! 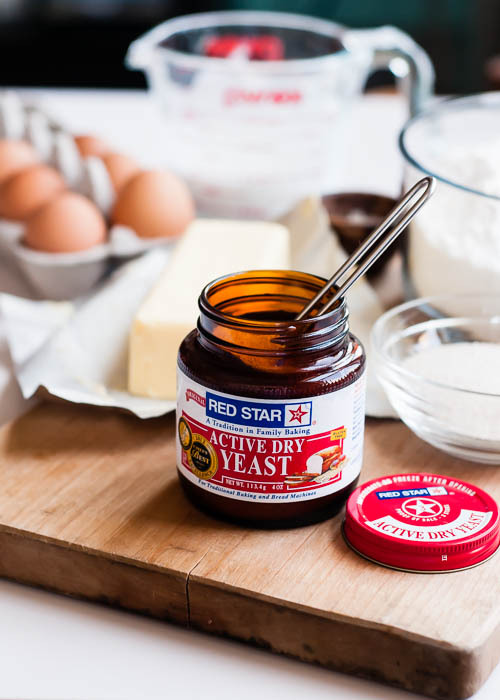 I love using Red Star Dry Active Yeast. (It’s always in my freezer!) 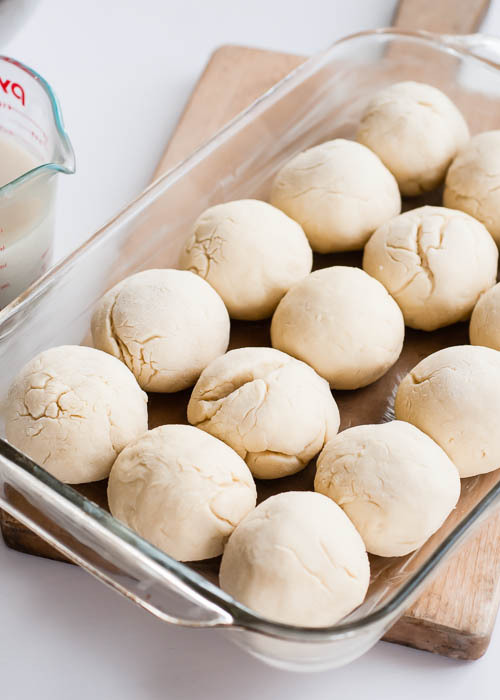 For this recipe I let the dough rise a little bit before forming the rolls. Normally for the gluten-free rolls, I only do one rise after they’ve been shaped. I think that also added to the light, fluffy texture. The coconut milk syrup is pretty spectacular. I used light coconut milk and thickened it with a little corn starch (more on that below), but coconut cream will work great too and doesn’t need to be thickened. Some people add sweetened condensed milk too, but I made these dairy free. All of those variations are in the notes below the recipe. 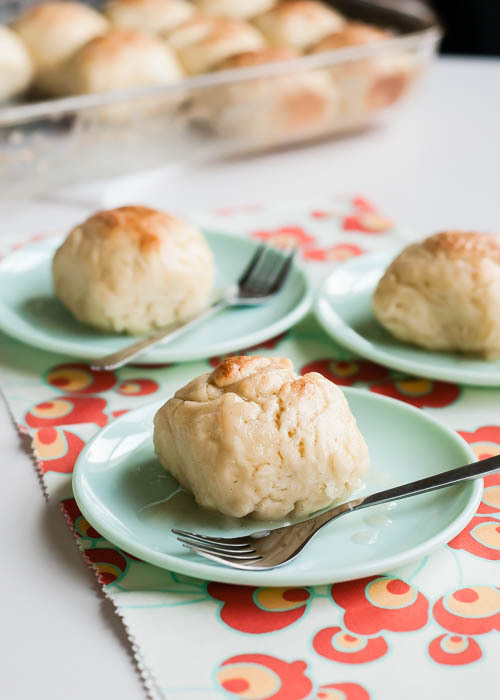 I was so happy my little experiment produced the rolls I was hoping for – light, fluffy, and sweet with plenty of coconut flavor. I hope you’ll love them too! 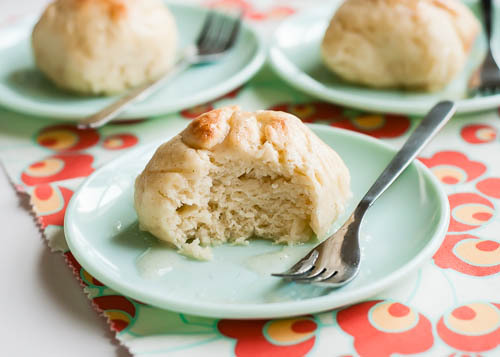 Fluffy, soft gluten-free rolls baked in a sweet coconut milk syrup. 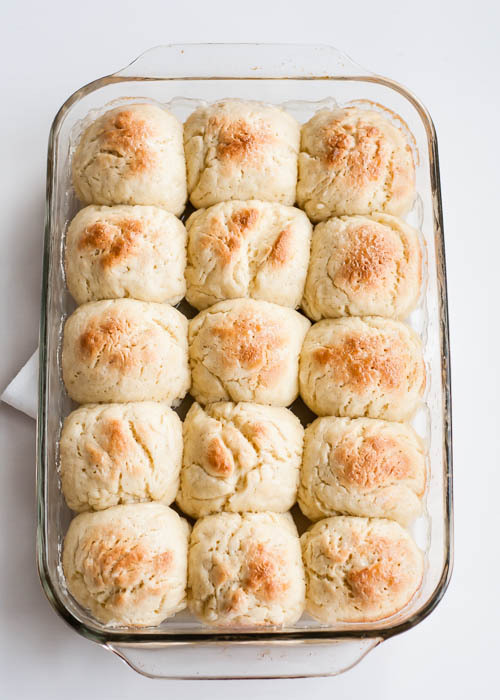 For the rolls - Dissolve yeast and ¼ teaspoon sugar in the ½ cup warm water. Stir and let stand until foamy, 5-10 minutes. Heat the coconut milk, shortening, sugar, and salt in a small saucepan or large measuring cup in the microwave. Don't let it boil, but it should be hot enough to dissolve sugar and salt. Stir and let cool a bit. 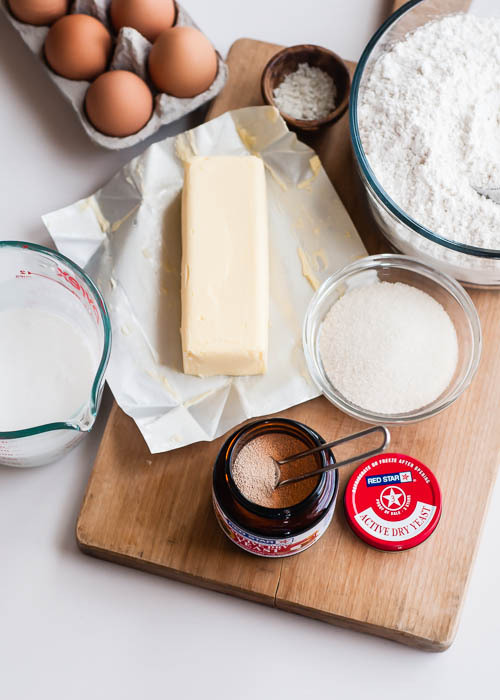 Place the eggs in the bowl of a stand mixer fitted with the paddle attachment. Turn mixer on low and beat eggs for a few seconds. Add the warm milk mixture to the eggs in a slow, steady stream. Add half of the gluten-free flour and mix well. Add the proofed yeast to the bowl and mix well. Scrape down the sides of the bowl, if needed. With mixer running on low, add the remaining flour. The dough will be pretty sticky, and that’s fine. Remove the bowl and paddle from the mixer. Scrape the dough off the paddle and sides of the bowl. Let stand for about 15-20 minutes in a warm place. During this time, the dough will thicken/set up a bit and start to rise. Sprinkle a little rice flour on a clean surface. 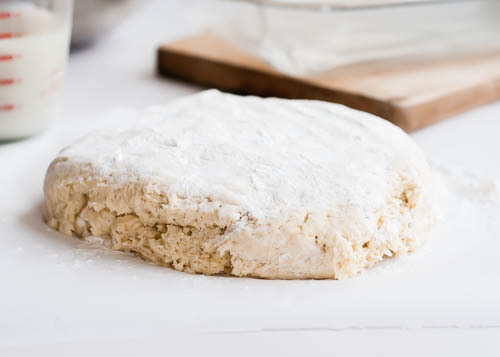 Turn dough out onto the flour and sprinkle with a little more rice flour. Pat it into a thick disk. This will help with creating evenly sized rolls. 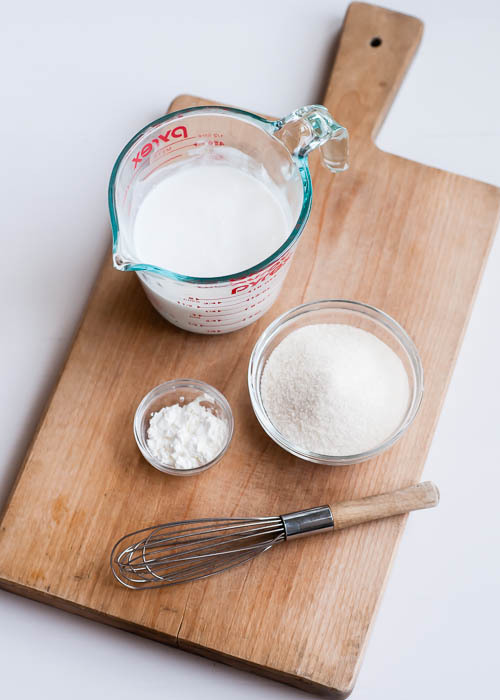 Coating your hands with a little flour each time, divide the dough into 15 evenly sized pieces. 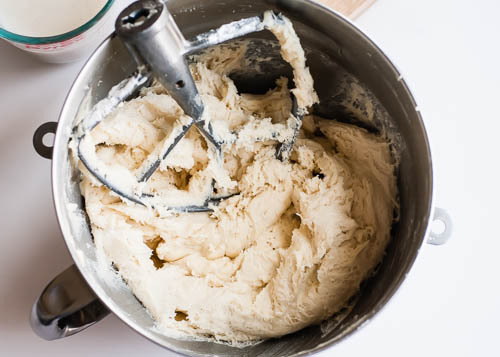 You can use a knife, but the dough is very, very sticky, so your hands are a bit easier. Gently pat the dough and form into balls. 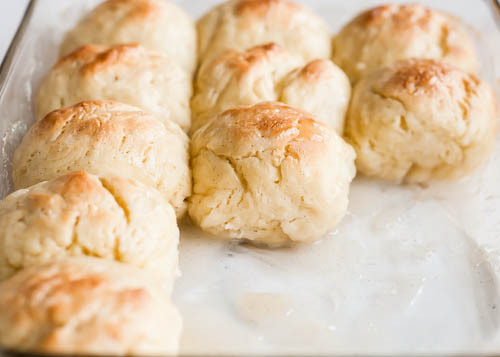 Don’t overwork the dough too much or they won't be as light and fluffy after they bake. 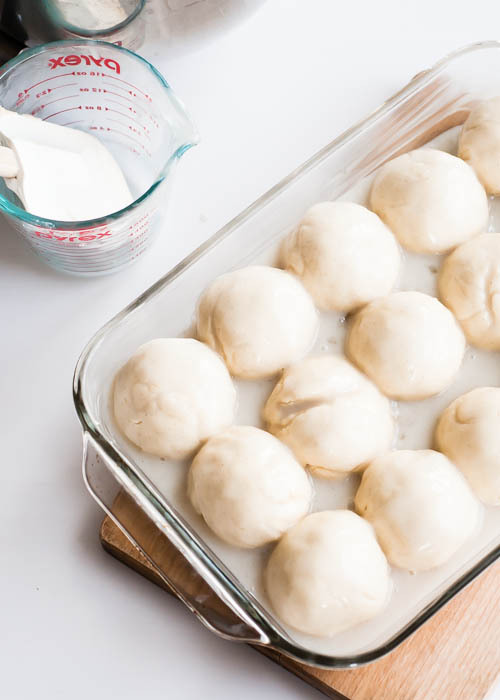 Grease a 9 by 13-inch glass baking dish. Place the rolls in five rows with three rolls in each row. Cover loosely with plastic wrap and let rise for about 45 minutes. Meanwhile, prepare the coconut syrup. Place coconut milk, sugar, cornstarch (if using), vanilla, and pinch salt in a small saucepan. Bring to a boil and cook for 60 seconds, whisking constantly. Remove from heat and let cool until slightly warm, but not hot. Set aside. 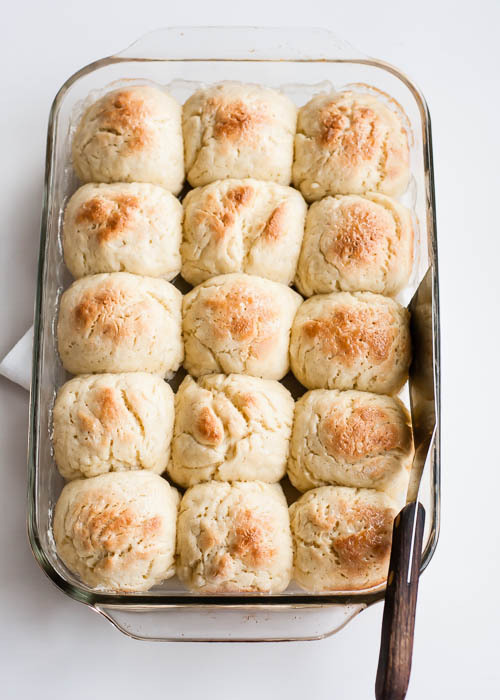 Preheat oven to 400 degrees F. Pour the warm syrup over the raised rolls, allowing some to drip over the top of each rolls. 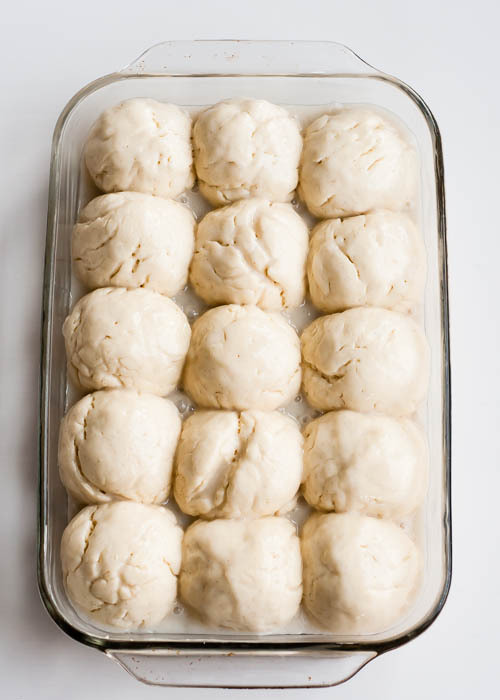 Place pan in oven and bake for 25-30 minutes. To serve, let cool slightly and serve from the pan or turn them out onto a serving platter, coconut syrup side up. Sift together or place in a blender or food processor and pulse to blend. Store in an airtight container in the freezer. Before using shake the bag, whisk, or sift again. 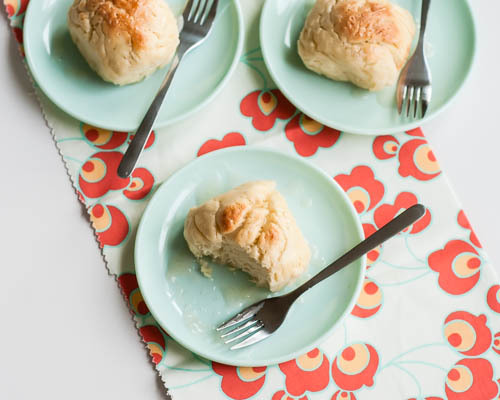 -I do not recommend using an egg replacer for this recipe as it would completely alter the texture of the rolls. -Coconut cream can be used in place of the coconut milk and cornstarch. 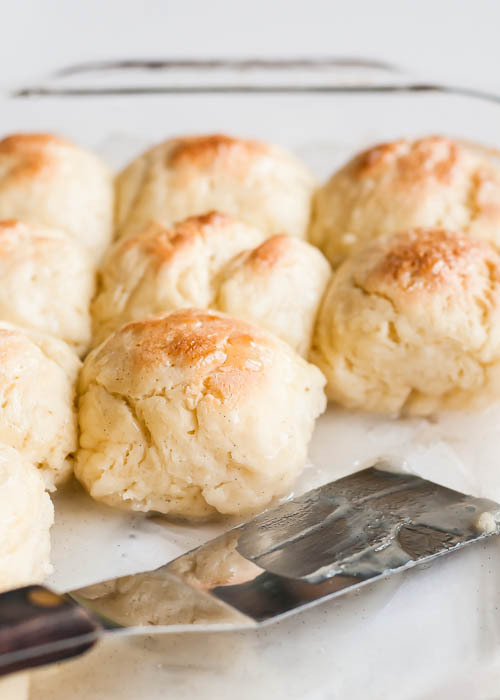 Mix the coconut cream with sugar, vanilla, and salt and gently warm before pouring over the rolls. 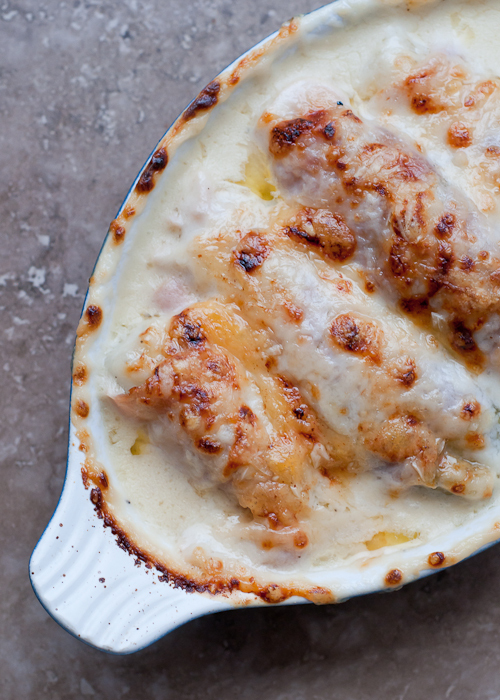 It will thicken as the rolls bake and make a richer sauce. -If using sweetened coconut cream, such as the Coco Lopez brand, omit the sugar from the syrup. 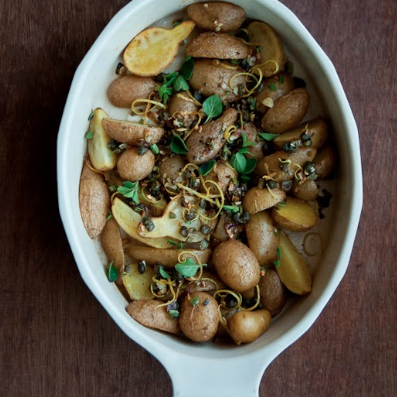 Disclosure: I was compensated for my time in developing this recipe. All opinions expressed are 100% my own. I only recommend products that I use and love in my kitchen. I’ve never heard of nor tried these. Man, baked in coconut syrup/milk! YUMMMM! You would love these, Becky! Wow! I know I would love these. You’re right there is nothing wrong with these. Ha! Let me know if you try them, Norma! I’ve never heard of these, but they look heavenly. A definite must-try, especially since they are gluten free (I never would have known). Thank you, Nora! They are pretty addictive! I freaking LOVE Pani Popo. Big surprise huh? 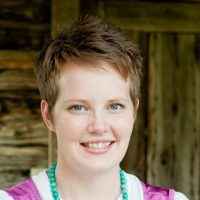 I’m so happy to have discovered your blog! What beautiful photos. 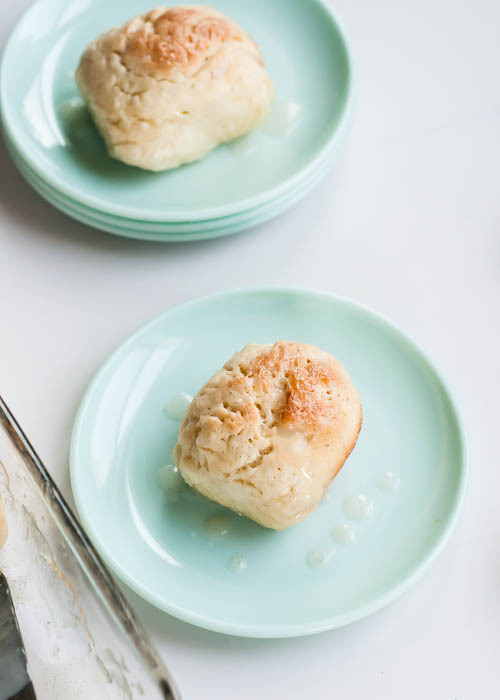 I love the looks of these rolls and was also just drooling over your quinoa/Meyer lemon/goat cheese pizza images. Looking forward to trying some of your recipes and continuing to follow! 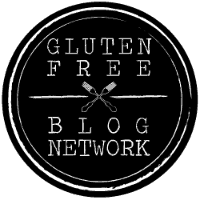 I was wondering if I could use the Bob’s Red Mill All Purpose Gluten Free Flour, because I would really rather not spend all that money on flour I probably will not be using any time soon… Do you think it would have a major effect on the outcome if I did? Each flour has a different ratio of flours. Some mixes don’t work well for yeast breads. If Bob’s has one made specifically for bread, I would go with that one vs. their regular blend which has a lot of chickpea flour in it. I don’t think it would work as well. Better Batter is a brand I’ve heard of before. I also like Pamela’s different blends and there is one for yeast breads that is quite good. 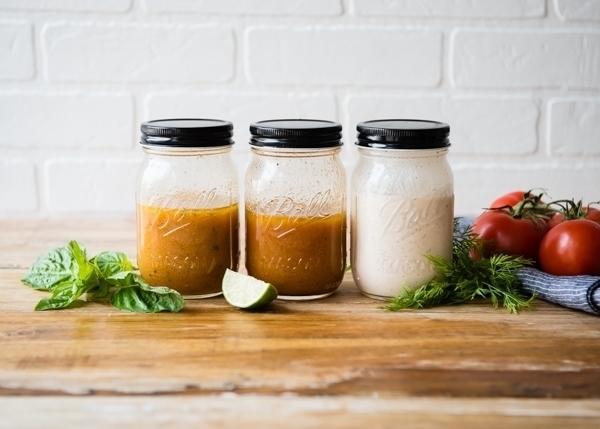 But I can’t say for sure about the results using a mix because I developed this so the texture would be light and fluffy and so I can’t guarantee you’ll get the same results. Let me know if you do try it and how it goes though. Where do I find vanilla paste? Hi Alissa! 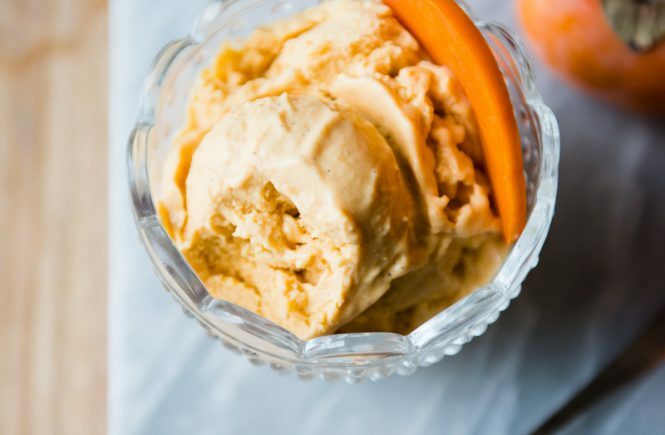 I have found it at Trader Joe’s, Whole Foods, some well-stocked grocery stores, Williams-Sonoma (and other kitchen supply stores), and online. 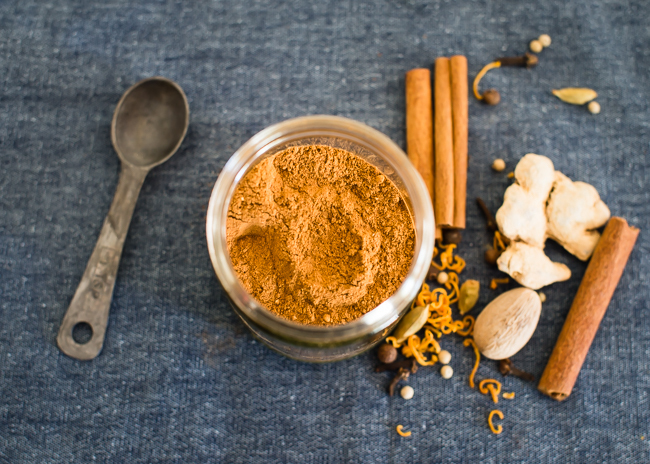 I like Heilala – that’s the brand I used in this recipe. But any that you find would work. If you can’t find it, you can always use vanilla extract instead. Thanks!! This recipe was so easy to make and so delicious. I never realized that I could yeast my GF breads! Duh! Thank you. Am going to try the lemon curd tart pie next tonight.